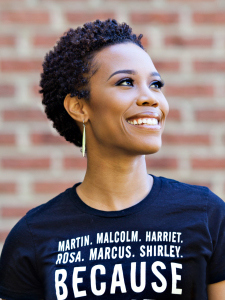 The award-winning creator of the widely popular photo campaign, “Because of Them We Can,” Eunique Jones Gibson (’07) has made her mark as an entrepreneur who strives to elevate the accomplishments of African-American trailblazers and inspire the next generation of leaders. Her photographs depicting young children reflecting images of influential black leaders from the past and present have won Gibson national acclaim. She started the project as a social campaign in February 2013 and decided to expand it after it went viral. Because of the success of the campaign, Gibson decided to resign her job to continue the project year-round. Since then, she has appeared on major news networks and partnered with CBS News, BET and ASPIRE to spread her campaign to larger audiences. She was also featured in the October 2014 edition of O Magazine. Gibson was named a White House Champion of Change in 2014 because of the impact of the "Because of Them We Can" campaign.